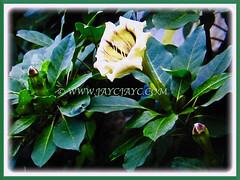 Chalice Vine or Cup of Gold is a very captivating climber that produces ornamental, chalice-shaped and fragrant flowers. 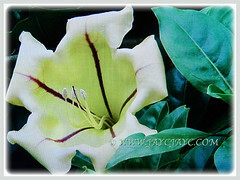 A free-flowering perennial vine that blooms year round. Fabulous when trained on pergolas and trellises with their huge and creamy yellow and golden flowers cascading downwards. Botanical Name: Solandra grandiflora (syn. : Swartzia grandiflora). 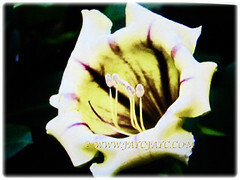 Common Names: Chalice Vine, Cup of Gold, Goldcup Vine, Golden Chalice Vine. Etymology: The genus name, Solandra is named in honour of Daniel C. Solander, the 18th century Swedish botanist. The specific epithet grandiflora means with large flowers. Origin: Native to the Caribbean, Mexico and South America. It widely cultivated elsewhere around the world. 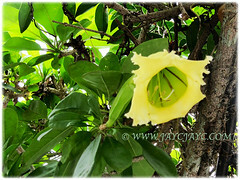 Features: Solandra grandiflora is from the genus Solandra that consists of about 8 species of flowering plants. A fast-growing climbing vine that requires a strong trellis or support. The thick and woody rope-like stems branch frequently and root at their nodes. They can grow over 61 m long, clinging with aerial rootlets and scrambling over everything in its way. Every single node on the vine sprouts tendrils and can take root. Hence, it makes the long vine stable and the many roots help provide it with necessary nutrients. Golden Chalice Vine produces elliptic, leathery and dark green leaves, up to 15 cm long with long petioles, growing from the main vine and side branches. Leaves have prominent lighter coloured midribs and lateral vein. 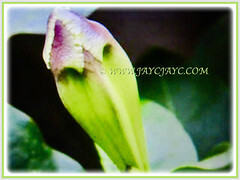 The huge and ornamental flowers are cup-shaped or chalice-shaped, up to 20 cm long, flaring open to 10-17.8 cm across. The five lobes of the corolla are reflexed and each lobe is marked with a narrow purplish brown ridge on the inside. 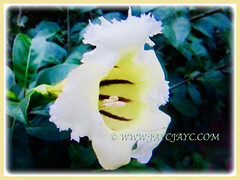 Bisexual flowers start out creamy or yellow and turn deeper golden as they age. They are night bloomers and scented, emitting a tropical nighttime fragrance which has been compared to coconut, banana or vanilla. It produces globose yellow fruits or berries, about 5 cm diameter and containing tiny seeds. These are rarely produced in cultivation. All parts of the plant are toxic and poisonous, so take precautions if you have pets or small children. 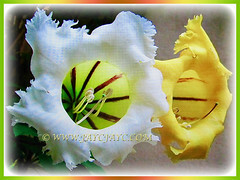 Culture (Care): Solandra grandiflora or Cup of Gold can be easily grown with least maintenance. Moisture: Moderate water requirements. It grows best with regular watering but blooms best when water is withheld. Let the vine grow for a while to produce vigorous new shoots, then withhold water until the leaves begin to wilt. Soil: Humus-enriched, loamy and well-drained soils. Nevertheless, it’s adaptable to any type of soils provided its well-drained. Hold back watering for established plants to stimulate better flowering. It tolerates severe pruning. Prune regularly as this beauty grows fast. 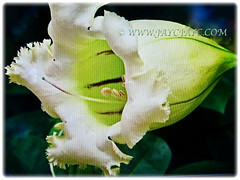 It flowers on new growth, so prune at any time of the year. Cut back long and vigorous shoots to induce branching and more flowers. Provide it a sturdy frame or support for it to climb as it is heavy. 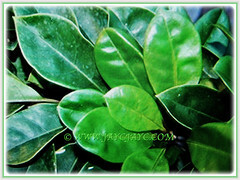 Take reasonable precautions like wearing gloves while pruning as it contains solanine along with other toxins. Rubbing your eyes after handling the plant may cause dilated pupils, vomiting, diarrhoea, headache and stomach pain. Generally free from serious garden pests and diseases. Solandra grandiflora or Chalice Vine can tolerate brief periods of freezing weather but prolonged frost will make it die down to ground level. Light frost blackens the leaves but plants usually recover to produce new growth. Gardeners living in colder climates will have to grow it in a pot if you want to see it bloom. Keep it a bit dry and root bound over the summer to constrain its size but water it well during its flowering time. Cup of Gold blooms intermittently through the year but mainly in the winter dry season. Prune the plant in late winter or early spring to encourage branching and flower production. Propagation: By stem cuttings and rooted with bottom heat. Usage: Solandra grandiflora or Chalice Vine will be excellent on pergolas or trellises where their spectacular and scented flowers can fall downwards. 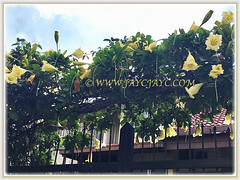 Given a chance to climb on a strong structure, this beautiful vine is suited to decorate your driveway and doorway. Ideal too for container planting. A magnet to butterflies and humming birds that are attracted by its huge and scented flowers.